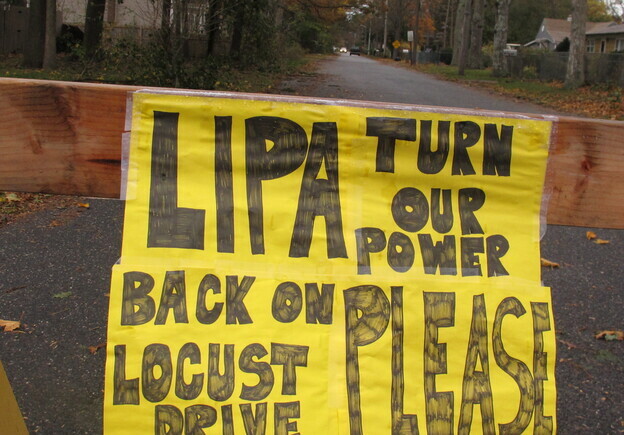 A plea to the Long Island Power Authority for electricity to be restored is posted on a barrier Wednesday in Mastic Beach, N.Y. The south shore Long Island community was among the hardest hit by the storm that pounded the northeast earlier in the week. A week after Hurricane Sandy hit the region, roughly a million people are still without power in the New York area, and more than one-third of those live on Long Island. In the hierarchy of hurricanes that have hit Mastic Beach, N.Y., over the years, this one ranks near the top, according to Mayor Bill Biondi. "This is the worse we've had in a long time," Biondi says. "I guess the only thing that was worse than this ... was the hurricane of 1938. I haven't seen or heard anything in between those years that was worse than this one." Mastic Beach Mayor Bill Biondi looks over a map of the flooding in his community from Hurricane Sandy. More than a thousand homes here were inundated with seawater. 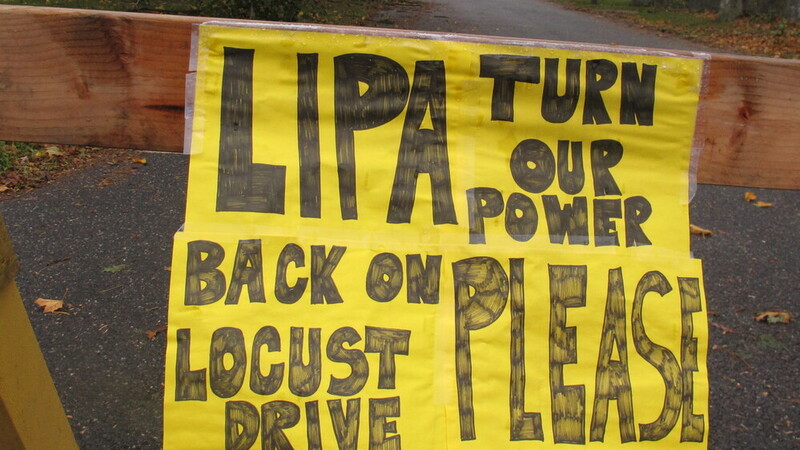 Temperatures are now dropping, but restoring power to these neighborhoods is a challenge. Mayor Biondi says the seawater that flooded homes here has corroded wires, creating countless fire hazards. A picture on his cell phone shows scorched siding on a house nearby. "[So] that's pretty much what could happen," he says. "An electrical box â" it starts to crackle and the next thing you know is the house goes on fire." Biondi says all the residents here want the power back on, but if the town moves too fast and hooks up houses like this it could make things worse. At the town hall Monday morning, townspeople pour in pleading for power. "It's bedlam," says Ann Smith, the town receptionist. "People want their electricity ... everybody expects us to concentrate just on them and there are an awful lot of people down here who are very bad off. They've lost their homes; they have lost everything." Now the area is bracing for another storm; a nor'easter that is expected to hit this town on Wednesday. "Right now we do have teams of assessors out there trying to go home to home," says Deputy Mayor Gary Stiriz. "[They're] trying to get an accurate assessment of what homes can be lived in and what homes are uninhabitable at this point." Stiriz says there are about 5,000 homes here, and authorities say more than a thousand are flooded. The storm surge crashed through the barrier beaches on Fire Island that usually protect this little town. It cut a new inlet that is 3,000-feet wide and brought more than four feet of water flooding into some neighborhoods. When flood water drained away it left a mix of fuel oil and sewage behind, and the insides of many homes are now highly toxic. 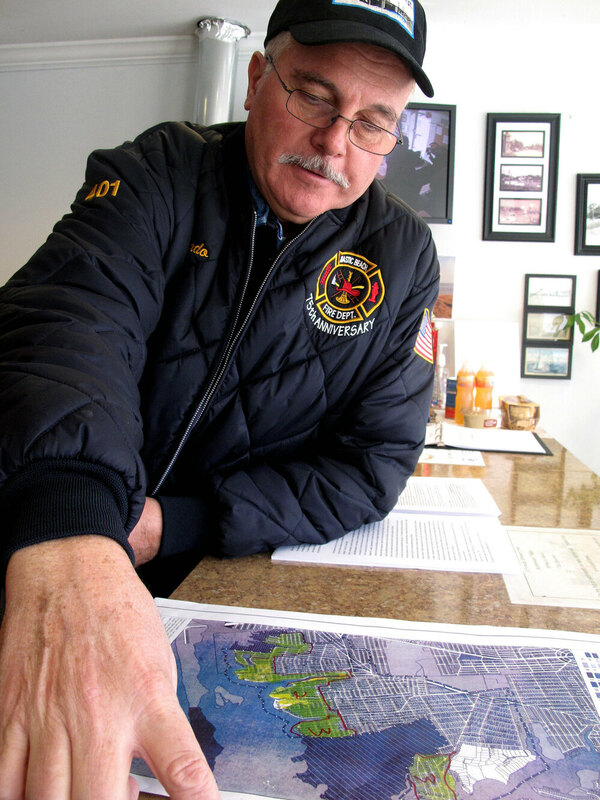 Stiriz spent his life building a business on the Great South Bay â" a marina â" that suffered hundreds of thousands of dollars in damage when most of it washed away this week. On top of that, his roof blew off and his home was destroyed. "All of the things you acquire when you have wood shops and motor shops and metal shops, [all gone]," Stiriz says. Stiriz is a native, and his family has been here since the 1920s. His own father rode out the 1938 hurricane and tidal wave. All his life his father told him to be careful, because anything invested in on the waterfront is "eventually going to become hurricane food." "Now, I know what he meant," he says.